Liver disease is serious and requires treatment and regular monitoring by a liver specialist. A liver specialist is known as a hepatologist and you need to be referred by your family doctor or general practitioner. Over nearly 40 years of practicing medicine I have seen many patients develop severe liver disease, which sadly could have been prevented by early detection and early referral to a hepatologist. There needs to be more awareness of liver disease so that patients can be treated early so that we can prevent cirrhosis, liver failure and liver cancer. Make sure you have your liver function checked annually with a blood test. I have presented my ideas on how to help those with liver diseases using nutritional medicine, which I have been using for many years with good success rates. However my recommendations do not replace the care of your own doctor and you should remain under the care of your own doctor whilst using nutritional therapies. 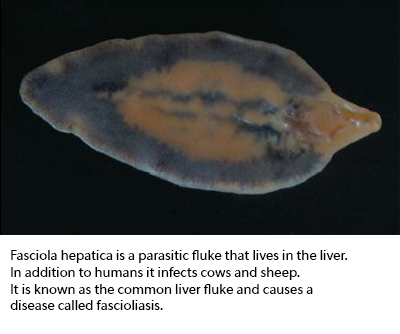 Liver fluke disease is a chronic parasitic disease of the bile ducts. 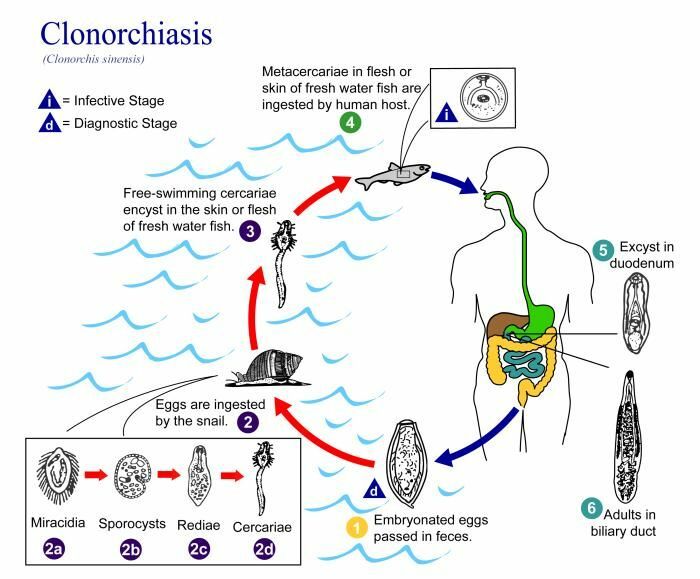 Infection with this parasite occurs through eating fluke-infested, fresh-water raw or undercooked fish. The most common types of liver flukes are Clonorchis sinensis, Opisthorchis viverrini and Opisthorchis felineus. 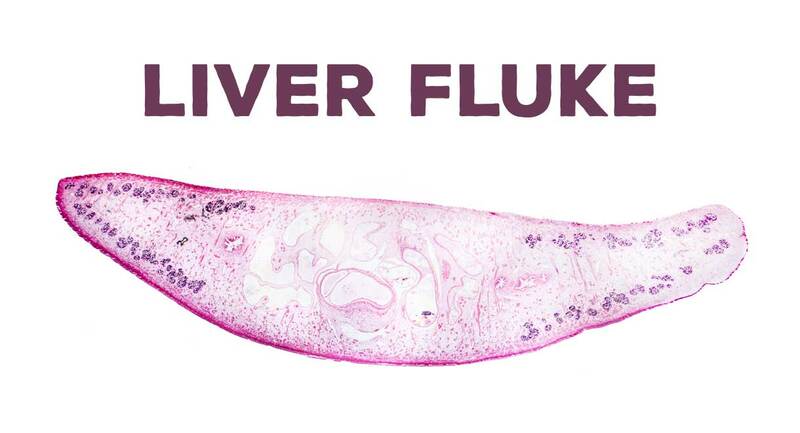 Approximately 35 million people are infected with liver flukes throughout the world and the very high incidence of cancer of the bile ducts (cholangiocarcinoma) in some countries is associated with a high prevalence of liver fluke infection. It is most common in South-East Asia, South Korea, Taiwan, Northern Vietnam, Laos and Northeast Thailand, Eastern Europe Eastern Russia, Manchuria, Northern Siberia and China. In China 15 million people carry liver fluke. People living along rivers are prone to infection by flukes because they have a habit of eating raw or undercooked fresh-water fish. This food-borne malady is an important public health issue and liver fluke infection does not receive the awareness it deserves. The control of liver fluke and any food borne infections requires collaboration between the sectors of public health, the food industry and the media. Consumer education is crucial to make people aware of the need to stop eating raw fish. Because of increasing immigration and travel more doctors should know about the high prevalence of liver fluke infection among healthy looking people and the long term severe complications of the infection. Liver fluke is not common in the Western world. In North American countries and Australia where many Asian immigrants are now living, people may carry liver fluke caught in their country of origin and because it is not previously commonly seen, the diagnosis is often missed until severe liver damage has resulted. The flukes get into the small bile ducts inside the liver and the gallbladder where they live for 20-30 years. The flukes cause chronic inflammation of the bile ducts causing scarring (fibrosis) of the bile ducts and bile duct dilatation. A liver fluke is a type of flat worm. One adult fluke lays 2000-4000 eggs each day and the eggs are excreted through the bile ducts and feces of the infected person. The cycle re-circulates via eating of raw fresh-water fish. Most people infected with this parasite have no symptoms; however patients with severe infection suffer from fatigue and abdominal discomfort. Long standing infection may cause stone formation in the bile ducts and the gallbladder, recurrent bacterial secondary infections in the bile ducts and cancer of the bile ducts. Severe infection can cause an enlarged liver (hepatomegaly) and complaints such as abdominal pain, anorexia, nausea, vomiting and indigestion. Jaundice is due to the mechanical obstruction in the bile ducts caused by a multitude of flukes, or it is due to bile duct obstruction caused by stones, or bile duct cancer (cholangiocarcinoma) as a late complication of chronic infection. In endemic areas, it is recommended to do screening tests such as a stool ova test and a liver ultrasound scan. The high risk groups for liver fluke infection are those who have a history of eating raw, freshwater fish in endemic areas. An ultrasound scan or CAT scan images may show dilatation of the bile ducts. If tests are positive then anthelminthic (anti-worm) drugs should be prescribed. People should be told to have regular periodic stool tests to check for the presence of eggs in the stool. Also anyone who has travelled to these parts of the world and eaten raw or under cooked fresh water fish should be tested. The typical appearance of past/healed liver fluke infection is widespread dilatation of the bile ducts inside the liver without evidence of an obstructing cause (dilatation without obstruction); this is seen on ultrasound, CAT or MRI scans of the liver. This picture is frequently found in healthy looking but infected people in endemic areas. You will need a scan – liver fluke infection will produce abnormal findings on ultrasound or computed tomography (CAT) scans of the liver. You will need to have samples of your stools (feces) tested – this looks for Fasciola eggs in stool (feces) samples. These samples can only be used in the chronic phase of infection. Some laboratories can quantify the intensity of infection which correlates with its severity. In clinical practice, where treatment failure occurs, the dosage may be increased to 20 mg/kg body weight in two divided doses 12-24 hours apart. In some countries triclabendazole is hard to obtain – if you have problems please email our team at liver doctor. The control of human fascioliasis mainly relies on timely treatment with triclabendazole, a measure that cures infected individuals and prevents development of advanced disease (cirrhosis and cancer). In endemic areas preventive drug therapy can be used as targeted treatment of school-age children (5–14 years), usually the population with the highest prevalence and intensity of infection, or as universal treatment (mass drug administration, or MDA) of the entire resident population. In such areas, individual-level diagnosis is not necessary; decisions about treatment are rather based on an assessment of the public health relevance of the disease. environmental measures such as containment of the snail intermediate hosts and drainage of grazing lands. If liver fluke is left undetected for years, this can become a very serious disease and cause destruction of the liver. Most people with liver fluke infection are completely unaware because they experience no symptoms at all. A small percentage of patients experience fatigue and non-specific abdominal discomfort, which easily gets mistaken for indigestion or irritable bowel syndrome. So it is important to have a high awareness of this insidious and destructive liver disease. Wash all vegetables several times in clean fresh running water. Soaking vegetables in very salty water can help remove many snails and other parasites and bacteria. The water does have to be very salty for this to work. Then rinse the salt off with clean water. Tablets are prescribed to kill the worms and these drugs are known as antihelmintic medications. If the disease is detected too late, sometimes the damage caused by the flukes is so extensive that a badly damaged part of the liver must be surgically removed. The sooner the infection is detected and eradicated, the less harm it is able to do to the bile ducts and the liver. An experimental drug called tribendimidine could help cure millions of people infected with liver fluke. In a study published in The Lancet medical journal, researchers found that tribendimidine is as safe as and more effective than the standard treatment for liver fluke. The standard treatment is a generic drug called praziquantel, which has a cure rate of 70 percent. The cure rates for tribendimidine were much better than praziquantel, although this needs to be confirmed in larger clinical trials. In contrast to the new drug, older drugs such as artemether, artesunate and mefloquine are not very effective and should not be recommended for treating liver fluke. Highest cure rates of over 70 percent can be achieved in patients treated with tribendimidine, followed by 56 percent for those treated with praziquantel. Cure rates are much less from taking combined mefloquine and artesunate. There are many types of parasitic worms and they cause disease in more than a billion people around the world. Over time these parasites have become increasingly resistant to available drugs; this brings an urgent need to find new drugs to fight them. Flukes are very hard to eradicate. It can be done but often takes a long time depending on the amount of flukes in the liver. If you look at forums on the Internet, people taking antihelmintic drugs have found that when clearing flukes they passed several hundred flukes every day in their stools. There are many Internet blogs (such as parasite drug forum) about liver fluke where people share their experiences of taking multiple antihelmintic drugs and rotating them until they clear all the flukes.